For those of you wondering whatever happened to the much hyped "nujazz" genre of the late 90s, just like "post rock" the term itself never really had any relevance - innovation is a natural development in the evolution of any music and the DJs and musicians who earned the title nujazz never lost their love for this sound: they have continued producing, evolving and playing their own style of music in the only way they see fit so that today the jazz scene is stronger in clubs than it ever was. Neujazz starts with Munich born Christian Prommer - one of the finest producers and DJs in the German club music scene and far beyond. The release of his new project Christian Prommer’s Drumlesson made big waves in 2007, covering dance classics in a jazz style such as "Strings Of Life". Here you can hear his remarkable cover of "Elle" by DJ Gregory. Two Banks of Four are a production duo from London who have been remixed by Herbert and Derrick Carter. Their 3rd album is due for release on Sonar Kollektiv in April 2008. Dalindeo’s aim is to bring back the freshness, lightness, beauty and rhythmic texture of the jazz era and combine it with a modern approach. Well known as the man behind The Five Corners Quintet and Nuspirit Helsinki, Tuomas Kallio has been involved with the band ever since their first release and has been a big influence in shaping the sextet’s sound. Their tune "Solifer Lento" is truly groovy stuff. Sleep Walker are a Japanese avant-garde jazz band that have had releases on Compost and BBE, as well as two albums on Especial Records. Their track, "Wind" - featuring Yukimi Nagano on vocals - has some serious ivory tinkling by Hajime Yoshizawa. The Shirley Eubanks version of Michael White’s "Blessing Song" is so funky you won’t be able to sit still listening to it. Soulstance have achieved considerable success with their band thanks to their original and exciting blend of nujazz, bossa, and lounge. 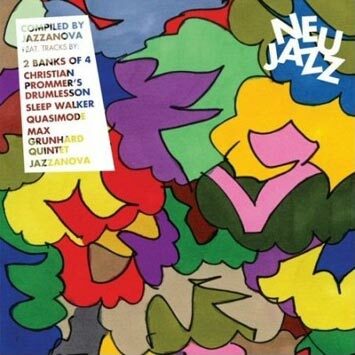 Meanwhile, the Lo Greco brothers are considered to be the inventors of nujazz, and they really do "Lead The Way" forward with their contribution to this compilation. "Last Nine Days" is a romantic ballad ideal for dancing in the moonlight by Japanese Jazz band Quasimode. From here we come to fellow Jap, Hajime, whose track "Waltz For Jason" is remixed by Two Banks of Four, bringing a nice twist of sampled electronica to the tune. Then lose yourself in the horn crescendos and warmth of Navasha Daya’s voice in Fertile Ground’s "Simple Timeless". Jazzanova originally composed & recorded "That Night" in 2002 together with Vikter Duplaix during the sessions for their first album In-Between. For the recording of the Belle et Fou score they decided to do a new version of the song. When Bembe Segue came to Jazzanova’s studio to record a new track for their new album, they played the faster 4/4 instrumental version to her. She really liked the idea of doing a more fiery and energetic version, and so the third "That Night" interpretation was born. Neujazz reflects the state of the art in contemporary jazz. Each track is carefully selected and compiled by the Jazzanova A&R team at Sonar Kollektiv. Just as they can rock any club when it comes to their turn to DJ, Jazzanova are masters in the art of putting together a functional compilation.